Popping into our inbox with all the suddenness and surprise of a popping popcorn kernel going *POP* is two-piece Inquire Within. I will resist the temptation to suggest that you “inquire within” to find out more about them. Simple things first, where are you guys from? We are from Marysville, Washington; it’s a town about thirty minutes from Seattle. The town itself isn’t all that exciting but it’s right in the middle of a lot of great places. Within a half hour drive we can go to Seattle, mountains, lakes, the ocean. I can’t complain too much about it here. Kelby and I (Brett) met about ten years ago in high school. We each had separate death metal bands and his was trying to recruit me to be their new singer. I wasn’t going to do it but every day for a good while Kelby’s mom would call me into her office (she worked at the school) and tell me to give it a shot. Eventually I caved in and went for it, instantly I knew I had to quit my band and join his. We have been making music together ever since. We started Inquire Within about four years ago when our old death metal band fell apart. This started as a three-piece acoustic band with another friend of ours but after making a few chill songs we decided to get back to making music brutal. After a year or so our other member left and then Kelby kept making babies so he left. This was a solo project of mine for a while until the other guitarist Dewey came back and finished the album with me and now it’s back to just Kelby and I. Before you get sick of being asked… Where did the band name come from? The name, Inquire Within comes from a song I wrote that was intended to be on our old band’s final album. That album was never finished and I didn’t want to just toss out some of those lyrics. When Kelby, Dewey and I were talking about getting this band started I had just read back through those lyrics and the line, “Inquire Within” stood out to me for where I was in life and the name fit with the original intent of having this band be acoustic and chill. The lyrics that the name comes from are now used on our song, “Becoming Human”. Our inspiration is all over the place. Lamb of God is a big influence on Kelby and I. When we first started writing together about ten years ago that was our favorite band. System Of A Down is another big influence Kelby and I share; they are one of the first metal bands we both got into. When we first started trying to make chill music we definitely spent a lot of nights jamming to Pink Floyd. Whitechapel and Behemoth have been big parts of our metal upbringing. Kelby gets down to a lot of Alice In Chains, Pearl Jam, Soundgarden… pretty much all our local Seattle grunge rock scene. Marilyn Manson has been one of my favorites since I was a kid. When it comes to guttural vocals, Cannibal Corpse is my go-to band, both the Chris Barnes and Corpsegrinder versions. The last couple years I’ve gotten really into Devin Townsend, the power in that dude’s voice got me to start taking opera lessons. Describing our music is a hard thing since we don’t stick to any styles or genres. Our album, Universe In My Head has fifteen songs that have a lot of differences in them. We had a total of sixteen musicians from nine countries contribute to the album, including Dirk Verbeuren of Megadeth/ ex-Devin Townsend Project and Kevin Talley who has been with Dying Fetus and Six Feet Under. The album has an orchestral acoustic sound with songs like “Blood Moon”, “Human Intitiated Contact”, “Without Eyes”, “I Still See You” and “Faded Memories”. There is a more metal vibe with “A Government Hijacked”, “Close Encounters”, “Dimensional Bleed Through”, “Crossroads Of My Mind” and “Denying My Angels”. We throwback to our roots of death metal with “Ending Humanity”, “Becoming Human” and “Cosmic Disclosure”. 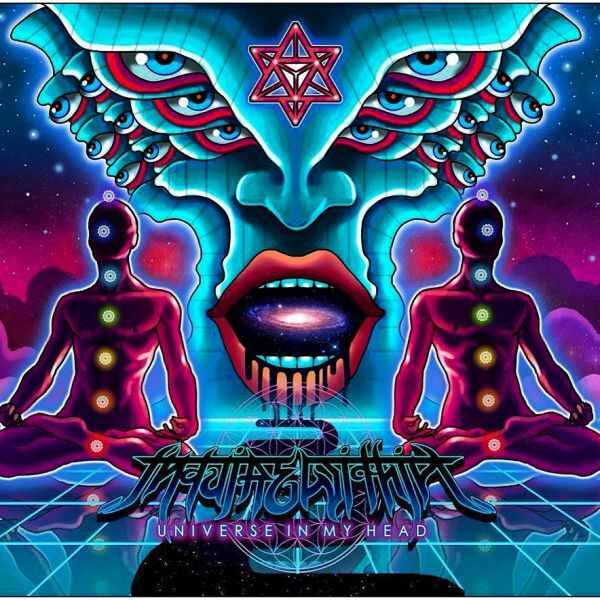 The album ends with a psychedelic metal feel with “Universe In My Head” and “Omniscient Mountain”. Those are vague descriptions since we have acoustic songs with death metal vocals and death metal songs with chill elements. We made a big cluster of sounds. There are a couple main themes in the lyrics that I wrote. Primarily they cover government cover ups and corruption especially of the “UFO” phenomenon (check out the documentary Unacknowledged on Netflix), questioning reality and spirituality from a lot of different angles. There are a few more personal songs about my daughter and the deaths of family members. Kelby and I have only done one show as Inquire Within and it was an acoustic set at a friend’s house party. I can’t give too much away of what we are planning for our full live shows that we are preparing but it will be really weird, funny and very intense. When Kelby and I had our death metal band we would always try to have as intense of a presence as we could. Now we are working out how to have that level of intensity in a new way since it’s not all death metal this time. What comes to mind with this question is a show from our old band, Sins of a Bullet. I would normally be drenched in blood on stage and at one show I decided to try and get the whole crowd to yell, “Hail Satan!! !” and then get “marked by the beast” by me putting a bloody left hand print on their faces…. to my surprise most of the crowd did it. I just thought it was funny but some people took it seriously and left. What kit do you use/ guitars do you play/ etc? I have a B.C. Rich Beast V Kerry King edition for my electric and an Epiphone acoustic guitar which is what was used on all our acoustic songs. On the album all the electric guitar was done on Dewey’s eight-string Ibanez. Kelby performs with a B.C. Rich Assassin and a Mark Morton Jackson Dominion, today he started writing with a 160 year old mandolin! 2017 is quickly coming to an end, our plan is to finish building everything we want for our live show hopefully in time to perform before the end of the year and to continue writing album two. Meanwhile I’ll be taking a class on scoring films, I want to make this next album as epic as possible! If you were second on a three band bill, who would you love to be supporting and which band would you choose to open for you? Picking just two other bands that I want to play with is breaking my balls, there are so many! A band I would love to open for would be Marilyn Manson, I think his crowd would be receptive to the fact that we have really calm music and brutal music. For the band opening for us…. well in all reality I don’t want people to think that Cannibal Corpse should ever be an opener but for the sake of wanting to play a show with them I am throwing their name in here! Can you give us a question to ask our next band of the day? A band of the day question could be, “if you had to pick just one album to listen to for the rest of your life, what would it be?”.